"Juárez, Mexico" redirects here. For other uses, see Juárez (disambiguation). Ciudad Juárez (/ˈhwɑːrɛz/ WHAH-rez; Juarez City. 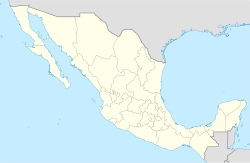 Spanish pronunciation: [sjuˈðað ˈxwaɾes] ( listen)) is the most populous city in the Mexican state of Chihuahua. The city is commonly referred to by locals as simply Juárez, and was known as Paso del Norte (Pass of the North) until 1888. Juárez is the seat of the municipality of Juárez with an estimated population of 1,428,508. The city lies on the Rio Grande (Río Bravo del Norte) river, south of El Paso, Texas, United States. Together with the surrounding areas, the cities form El Paso–Juárez, the second largest binational metropolitan area on the Mexico–U.S. border (after San Diego–Tijuana), with a combined population of almost 2.3 million people. There are four international points of entry connecting Ciudad Juárez and El Paso, including the Bridge of the Americas, Ysleta International Bridge, Paso del Norte Bridge and Stanton Street Bridge. These combined allowed 29,391,513 crossings in 2017, making Ciudad Juárez a major point of entry and transportation into the U.S. for all of central northern Mexico. The city has a growing industrial center which is made up in large part by more than 300 maquiladoras (assembly plants) located in and around the city. According to a 2007 New York Times article, Ciudad Juárez "is now absorbing more new industrial real estate space than any other North American city". In 2008, fDi Magazine designated Ciudad Juárez "The City of the Future". The launch of the Mexican drug war in 2007 increased violence dramatically during that year. In more recent years, violence has gone down with a decrease in homicides since 2010. In 1659, as Spanish explorers sought a route through the southern Rocky Mountains, the Franciscan Friar García de San Francisco founded Ciudad Juárez as Paso del Norte ("North Pass"). The Misión de Nuestra Señora de Guadalupe became the first permanent Spanish development in the area. The Native American population was already present there. The Franciscan friars established a community that grew in importance as commerce between Santa Fe and Chihuahua passed through it. The wood for the bridge across the Rio Grande first came from Santa Fe, New Mexico in the 18th century. The original population of Suma, Jumano and immigrants brought by the Spanish as slaves from Central New Spain grew around the mission. In 1680 during the Pueblo Revolt, some members of the Tigua branch of the Pueblo became refugees from the conflict and a Mission was established for them in Ysleta del Paso del Norte. Other colonial era settlements included Senecú, Real de San Lorenzo, and the Presidio de San José. The population of the entire district reached some 5,000 around 1750 when the Apache attacked the other native towns around the missions. The 1848 Treaty of Guadalupe Hidalgo established the Rio Grande as the border between Mexico and the United States, separating the settlements on the north bank of the river from the rest of the town. Such settlements were not part of the town at that time; as the military set up its buildings the town grew around it. This would later become El Paso, Texas. From that time until around 1930 populations on both sides of the border could move freely across it. Ciudad Juárez and El Paso are one of the 14 pairs of cross-border town naming along the Mexico–U.S. border. During the French intervention in Mexico (1862–1867), Paso del Norte served as a temporary stop for Benito Juárez's republican forces until he established his government-in-exile in Chihuahua. After 1882 the city grew with the arrival of the Mexican Central Railway. Banks, telegraph, telephone, and trams appeared, indicating the city's thriving commerce, in the firm control of the city's oligarchy of the Ochoa, Samaniego, Daguerre, Provencio, and Cuarón families. In 1888, Paso del Norte was renamed in honor of Juárez. The city expanded significantly thanks to Díaz's free-trade policy, creating a new retail and service sector along the old Calle del Comercio (now Vicente Guerrero) and September 16 Avenue. A bullring opened in 1899. The Escobar brothers founded the city's first institution of higher education in 1906, the Escuela Particular de Agricultura. That same year, a series of public works are inaugurated, including the city's sewage and drainage system, as well as potable water. A public library, schools, new public market (the old Mercado Cuauhtémoc) and parks dotted the city, making it one of many Porfirian showcases. [clarification needed] Modern hotels and restaurants catered to the increased international railroad traffic from the 1880s on. 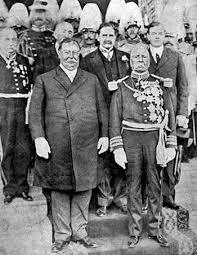 In 1909, Díaz and William Howard Taft planned a summit in Ciudad Juárez and El Paso, a historic first meeting between a Mexican and a U.S. president, and also the first time a U.S. president would cross the border into Mexico. But tensions rose on both sides of the border over the disputed Chamizal strip connecting Ciudad Juárez to El Paso, even though it would have been considered neutral territory with no flags present during the summit. The Texas Rangers, 4,000 U.S. and Mexican troops, U.S. Secret Service agents, FBI agents and U.S. marshals were all called in to provide security. Frederick Russell Burnham, the celebrated scout, was put in charge of a 250 private security detail hired by John Hays Hammond. On October 16, the day of the summit, Burnham and Private C.R. Moore, a Texas Ranger, discovered a man holding a concealed palm pistol standing at the El Paso Chamber of Commerce building along the procession route. Burnham and Moore captured, disarmed, and arrested the assassin within only a few feet of Díaz and Taft. The city was Mexico's largest border town by 1910—and as such, it held strategic importance during the Mexican Revolution. In May 1911, about 3,000 revolutionary fighters under the leadership of Francisco Madero laid siege to Ciudad Juárez, which was garrisoned by 500 regular Federal troops under the command of General Juan J Navarro. Navarro's force was supported by 300 civilian auxiliaries and local police. After two days of heavy fighting most of the city had fallen to the insurrectionists and the surviving federal soldiers had withdrawn to their barracks. Navarro then formally surrendered to Madero. The capture of a key border town at an early stage of the revolution not only enabled the revolutionary forces to bring in weapons and supplies from El Paso, but marked the beginning of the end for the demoralized Diaz regime. During the subsequent years of the conflict, Villa and other revolutionaries struggled for the control of the town (and income from the Federal Customs House), destroying much of the city during battles in 1911 and 1913. Much of the population abandoned the city between 1914 and 1917. Tourism, gambling, and light manufacturing drove the city's recovery from the 1920s until the 1940s. A series of mayors in the 1940s–1960s, like Carlos Villareal and René Mascareñas Miranda, ushered in a period of high growth and development predicated on the PRONAF border industrialization development program. A beautification program spruced up the city center, building a series of arched porticos around the main square, as well as neo-colonial façades for main public buildings such as the city health clinic, the central fire station, and city hall. The Cathedral, built in the 1950s, gave the city center the flavor of central Mexico, with its carved towers and elegant dome, but structural problems required its remodeling in the 1970s. The city's population reached some 400,000 by 1970. Juárez has grown substantially in recent decades due to a large influx of people moving into the city in search of jobs with the maquiladoras. As of 2014[update] more technological firms have moved to the city, such as the Delphi Corporation Technical Center, the largest in the Western Hemisphere, which employs over 2,000 engineers. Large slum housing communities called colonias have become extensive. Juárez has gained further notoriety because of violence and as a major center of narcotics trafficking linked to the powerful Juárez Cartel, and for more than 1000 unsolved murders of young women from 1993 to 2003. Due to its location in the Chihuahuan Desert and high altitude, Ciudad Juárez has a cold desert climate (Köppen: BWk). Seasons are distinct, with hot summers, mild springs and autumns, and cold winters. Summer average high is 38.3 °C (100.9 °F) with lows of 26.3 °C (79.3 °F). Winter highs average 19.6 °C (67.3 °F) with lows of −1.7 °C (28.9 °F). Rainfall is scarce and greater in summer. Snowfalls occur occasionally (about 4 times a year), between November and March. On December 26/27, 2015, parts of the city received 40 cm (16 in) of snow within a 24-hour period beating the previous record of 28 cm (11 in) set in 1951. The record high is 49 °C (120 °F) and the record low is −23 °C (−9 °F). Source: SMNCite error: A <ref> tag is missing the closing </ref> (see the help page). Ciudad Juárez has many affluent neighborhoods, such as Campestre, Campos Elíseos, and Misión de Los Lagos. Other neighborhoods, including Anapra, Chaveña, and Anáhuac, would be considered more marginal, while the remaining neighborhoods in Juárez represent the middle- to working-class, for example, Infonavit, Las Misiones, Valle de Juárez, Lindavista, Altavista, Guadalajara, Galeana, Flores Magón, Mariano Escobedo, Los Nogales, and Independencia. Between the 1960s and 1990s, Juárez saw a high level of population growth due in part to the newly established maquiladoras. The end of the Bracero Program also brought workers back from border cities in the U.S. through Ciudad Juárez, contributing to the growing number of citizens. The average annual growth in population over a 10-year period [1990–2000] was 5.3%. According to the 2010 population census, the city had 1,321,004 inhabitants, while the municipality had 1,332,131 inhabitants. During the last decades the city has received migrants from Mexico's interior, some figures state that 32% of the city's population originate outside the state of Chihuahua, mainly from the states of Durango (9.9%), Coahuila (6.3%), Veracruz (3.7%) and Zacatecas (3.5%), as well as from Mexico City (1.7%). Though most new residents are Mexican, some also immigrate from Central American countries, such as Guatemala, El Salvador, Honduras and Nicaragua. However, a March 2009 article noted there has been a mass exodus of people who could afford to leave the city due to the ongoing violence from the Mexican Drug War. The article quoted a city planning department estimate of over 116,000 abandoned homes, which could roughly be the equivalent of 400,000 people who have left the city due to the violence. A September 2010 article in The Guardian said of Ciudad Juárez: "About 10,670 businesses – 40% of the total – have shut down. A study by the city's university found that 116,000 houses have been abandoned and 230,000 people have left." The city is governed by a municipal president and an 18-seat council. The president is Armando Cabada Alvidrez, who won as an Independent candidate in 2016. Six national parties are represented on the council: the PRI, the National Action Party, Ecologist Green Party of Mexico, Party of the Democratic Revolution, Labor Party and the New Alliance Party. Violence towards women in the municipality increased dramatically between 1993 and the mid-2000s, with approximately 370 girls and women murdered and at least 400 women reported missing. Escalating turf wars between the rival Juárez and Sinaloa Cartels led to increasingly brutal violence in the city beginning in 2007. The Juárez police department dismissed approximately 800 officers in an effort to clean up corruption within its ranks.[when?] Recruitment goals set by the department called for the force to more than double. In 2009, a vigilante group calling itself Juárez Citizens Command threatened to put a stop to all the perpetrators of violence if the government continued to fail to curb the violence in the city. Government officials expressed concern that such vigilantism would contribute to further instability and violence. In 2008, General Moreno and the Third Infantry Company took over the fight against the cartels in town. They were removed in 2009, with the general and 29 of his associates now in custody and awaiting trial for charges of murder and civil rights violations. In response to increasing violence in the city, the presence of the Mexican Armed Forces and Federal Police has almost doubled. As of March 2009, at least 4500 soldiers and federal police were in the city to curtail mostly drug cartel-related violence. By August 2009 there were more than 7500 soldiers augmented by an expanded and highly restaffed municipal police force. As of January 2013, Juárez's murder rate placed #37 of the highest reported in the world, at 38 murders per 100,000 inhabitants. This marked a decrease of 70% from 2008, when the rate was 130 murders per 100,000 inhabitants, ranking #1 in the statistic and exceeding second-place Caracas's statistic of 96 murders per 100,000 inhabitants by 35% for the same period. Journalist Charles Bowden, in an August 2008 GQ article, wrote that multiple factors, including drug violence, government corruption and poverty, led to a dispirited and disorderly atmosphere that permeated the city. After the homicide rates escalated to the point of making Ciudad Juárez the most violent city in the world, violent crime began to decline in the early 2010s. In 2012, homicides were at their lowest rate since 2007 when drug violence flared between the Sinaloa and Juárez Cartel. That trend has continued in 2015 with 300 homicides reported, the lowest number since 2006. Explanations for the rapid decline in violence include the Sinaloa Cartel's success in defeating its rivals, as well as federal, state and local government efforts to combat crime and improve the city's quality of life. The cause of the reduction in crime is the subject of speculation. One theory attributes it to deals the rival gangs made to coexist once the federal police were withdrawn in 2011. Another holds that a more powerful trafficking network, such as Joaquin "El Chapo" Guzman's Sinaloa cartel, might have moved in and restored a kind of "order among thieves." Others attribute it to the end of the cartel war between Juárez and Sinaloa, the arrest or dismissal of many policemen with cartel ties, resolutions reached by liaisons between government and a group of local leaders called "La Mesa de Seguridad y Justicia", and the creation of an anti-extortion squad to combat extortion inflicted upon local companies. Crime was significantly reduced from 2010 to 2014, with 3,500 homicides in 2010 and 430 in 2014. In 2015, there were only 311 homicides. The decrease in crime inspired more business in the city. Some citizens who left because of the violence have since returned with their families. Many of them had moved their businesses to El Paso. In addition, U.S companies are investing more in Juárez. Community centers work with victims of crime and teach women how to defend themselves. Citizens have also formed neighborhood watch groups and patrol neighborhoods. "La Fundacion Comunitaria de la Frontera Norte" is giving young people career opportunities and giving people hope. Technology HUB is a startup incubator working to diversify the city's economy and move the regions low-skill manufacturing industry into an innovation cluster. Its economic development projects are in line with the research of University of Berkeley Professor Enrico Moretti. Innovation economies are found to be more adaptive to shifting tech and trade conditions and more resilient to the kind of civil unrest that plagued Ciudad Juarez in the past. In addition, city officials have said that they have plans to increase tourism in the city. For example, in April 2015, the city created a new campaign to increase tourism called "Juarez is waiting for you". That same month, U.S. representative Beto O'Rourke visited Juárez to give a speech about how much Juárez has changed for the better. A children's museum was opened in honor of the children who lost their parents during the violent years. Businesses that were closed because of the violence and extortion have reopened in recent years. The city's violence was depicted in the 2015 film Sicario, drawing criticism and calls for a boycott from Juarez mayor Enrique Serrano Escobar, who said the film presented a false and negative image of the city. He said the violence the film depicted was accurate through about 2010, and that the city had made progress in restoring peace. Norma Andrade, founding member of Nuestras Hijas de Regreso a Casa A.C.
Part of the action of the 2015 film Sicario is set in Juárez. The Bob Dylan song "Just Like Tom Thumb's Blues" is set in a nightmarish depiction of Juárez. Ciudad Juárez and the female homicides which took place there are the inspiration for the city of Santa Teresa in Roberto Bolano's 2004 novel 2666. The El Paso Regional Economic Development Corporation indicated that Ciudad Juárez is the metropolis absorbing "more new industrial real estate space than any other North American city." 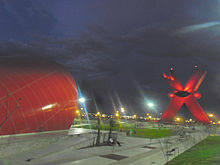 The Financial Times Group through its publication The Foreign Direct Investment Magazine ranked Ciudad Juárez as the "City of the Future" for 2007–2008. The El Paso–Juárez area is a major manufacturing center. CommScope, Electrolux, Bosch, Foxconn, Flextronics, Lexmark, Delphi, Visteon, Johnson Controls, Toro, Lear, Boeing, Cardinal Health, Yazaki, Sumitomo, and Siemens are some of the foreign companies that have chosen Ciudad Juárez for their business operations. In the 1990s, traditional brick kilns made up a big part of the economic informal sector. These were typically located in the poorer regions of Juárez. The kilns used open-air fires, where certain materials that were burned generated a lot of air pollution. Along with rapid industrialization, small brick kilns have been a big contributor to the high amount of air pollution in Ciudad Juárez. Juárez has four local newspapers: El Diario, El Mexicano, El PM and Hoy. El Norte was a fifth, but it ceased operations on April 2, 2017, following the murder of journalist Miroslava Breach because, the paper explained, the recent killings of several Mexican journalists made the job too dangerous. There are 16 over-the-air television stations broadcasting in the Ciudad Juárez–El Paso area. Including subchannels there are 33 different channels. There are three paid television signals available and 24 radio station signals in AM and 21 in FM. The main public transportation system in the city is the public bus system. The public buses run the main streets of Ciudad Juárez throughout the day, costing eight pesos (less than 40 cents) to ride one. Due the aging current bus fleet being considered potentially outdated, the municipal government is working on replacing the buses with new ones, along with improving the bus stops, such as by equipping them with shade. The ViveBus Bus Rapid Transit (BRT) system opened to the public in November 2013 with the first route of five planned. The project was made a reality with the collaboration of the local municipal government, the private enterprise of Integradora de Transporte de Juárez (INTRA) as well as other city government agencies. Studies have shown that the current bus system averages 8 mph (13 km/h) while the new system is projected to average 16 mph (26 km/h). The BRT system studies conducted by the Instituto Municipal de Investigacion Y Planeacion project a daily ridership of 40,000. The first of the five routes opened to users in late 2013 and is officially named Presidencia-Tierra Nueva and has 34 stations distributed along the north to south corridor. The route starts at Avenida Francisco Villa, follows north to Eje Vial Norte-Sur then veers left at Zaragoza Blvd. and ends at Avenida Independencia and the elevated Carretera Federal 2. The city is served by Abraham González International Airport, with flights to several Mexican cities. It accommodates national and international air traffic for the city. Nearby El Paso International Airport handles flights to cities within the United States. The first bridge to cross the Rio Grande at El Paso del Norte was built in the time of New Spain, over 250 years ago, from wood hauled in from Santa Fe. Today, this bridge is honored by the modern Santa Fe Street Bridge, and Santa Fe Street in downtown El Paso. There is also a land crossing at nearby Santa Teresa, New Mexico. According to the latest estimates, the literacy rate in the city is in line with the national average: 97.3% of people above 15 years old are able to read and write. Juárez has three public and two private universities. The Instituto Tecnológico de Ciudad Juárez (ITCJ), founded in 1964, became the first public institution of higher education in the city. The Autonomous University of Ciudad Juárez (Universidad Autónoma de Ciudad Juárez, UACJ), founded in 1968, is the largest university in the city. It has several locations inside of the city including the Institute of Biomedical Sciences (Instituto de Ciencias Biomédicas, ICB), the Institute of Social and Administrative Sciences (Instituto de Ciencias Sociales y Administrativas, ICSA), the Institute of Architecture, Design and Art (Instituto de Arquitectura, Diseño y Arte, IADA), the Institute of Engineering and Technology (Instituto de Ingeniería y Tecnología, IIT) and the University City (Ciudad Universitaria, CU) located in the southern part of Ciudad Juárez. The IADA and IIT share the same location appearing to be a single institute where the students from both institutes share facilities as buildings or classrooms with the exception of the laboratories of Engineering and the laboratories of Architecture, Design and Arts. The UACJ also has spaces for Fine Arts and Sports. These latter services are considered among the best because they recluse nearly 30,000 participants in sports such as swimming, racquetball, basketball and gymnastics, and arts such as Classical Ballet, Drama, Modern Dance, Hawaiian and Polynesian Dances, Folk dance, Music and Flamenco. The Faculty of Political and Social Sciences of the Autonomous University of Chihuahua (Universidad Autónoma de Chihuahua, UACH) which has delivered 70% of the city's media and news crew, is located in the city. The local campuses of the Monterrey Institute of Technology and Higher Education (ITESM) and the Autonomous University of Durango (UAD) are private universities. ^ The designation of "heroic" was added on the request of the governor of Chihuahua, César Duarte Jáquez in 2011, based on the city's role in the Mexican Revolution. ^ "The El Paso Regional Economic Development Corporation". September 18, 2013. Archived from the original on September 18, 2013. ^ "Juárez". Catálogo de Localidades. Secretaría de Desarrollo Social (SEDESOL). Archived from the original on April 12, 2015. Retrieved April 23, 2014. ^ Chisholm, Hugh, ed. (1911). "Ciudad Juarez" . Encyclopædia Britannica. 6 (11th ed.). Cambridge University Press. p. 402. 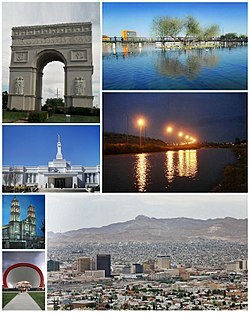 ^ "History of Ciudad Juárez". El Paso County Historical Society. Archived from the original on October 9, 2011. Retrieved November 5, 2011. ^ a b "Informe 2018 Así Estamos Juarez" (PDF). April 26, 2018. Retrieved April 1, 2019. ^ "El Paso/ Juarez Crossing Volumes". pdnuno.com. December 2017. Retrieved April 1, 2019. ^ "Ciudad Juarez, Chihuahua, Mexico - fDi City of the Future 2007 / 2008". Archived from the original on April 5, 2015. Retrieved August 26, 2016. ^ "Indicadores de Seguridad Febrero 2019". mesadeseguridad.org. Retrieved April 1, 2019. ^ Harris 2009, p. 1. ^ Harris 2009, p. 14. ^ Harris 2009, p. 15. ^ Daily Mail 1909, p. 7. ^ van Wyk 2003, pp. 440–446. ^ Harris 2009, p. 16. ^ Hammond 1935, pp. 565-66. ^ Harris 2009, p. 213. ^ Harris 2004, p. 26. ^ "El norte de México vive una emergencia por el frío; nevada histórica paraliza Juárez". SinEmbargo. Archived from the original on December 31, 2015. Retrieved December 28, 2015. ^ "Chihuahua (Mexico): State, Major Cities & Towns - Population Statistics in Maps and Charts". Citypopulation.de. Archived from the original on June 28, 2018. Retrieved June 28, 2018. ^ Boudreaux, Corrie. "Public Memorialization and the Grievability of Victims in Ciudad Juárez". Social Research. 83 (2). ^ a b c Coronado, Roberto; Lucinda Vargas (2001). "Economic Update on El Paso del Norte" (PDF). Business Frontier (2). Archived from the original (PDF) on October 3, 2008. Retrieved September 15, 2008. ^ Casey, Nicholas (March 20, 2010). "Cartel Wars Gut Juárez, a Onetime Boom Town". Wall Street Journal. Retrieved March 22, 2010. ^ Mexican Drug War: The New Killing Fields Archived February 28, 2017, at the Wayback Machine, The Guardian, September 3, 2010. Retrieved September 4, 2010. ^ "Index of councilors" (in Spanish). Gobierno Municipal de Juárez. Archived from the original on February 26, 2009. Retrieved November 22, 2009. ^ a b Sarriya, Nidya (August 3, 2009). "Femicides of Juárez: Violence Against Women in Mexico". Council on Hemispheric Affairs. Archived from the original on January 13, 2010. Retrieved November 28, 2009. ^ "Mexico: Justice fails in Ciudad Juarez and the city of Chihuahua". Amnesty International. Archived from the original on March 3, 2012. Retrieved March 19, 2012. ^ Kocherga, Angela (December 7, 2012). "As murders plummet in Juarez, controversial police chief earns praise". WFAA.com. Archived from the original on December 13, 2012. Retrieved December 7, 2012. ^ Balderrama, Monica (September 10, 2008). "Juárez Police Department To Dismiss Third Of Force". KFOXTV.com. Archived from the original on April 6, 2011. Retrieved November 28, 2009. ^ Borunda, Daniel. "Juarez vigilante group claims it will kill one criminal every 24 hours". El Paso Times. Archived from the original on January 11, 2014. Retrieved November 28, 2009. ^ Borunda, Daniel. "Vigilante group sets deadline for Juárez". El Paso Times. Archived from the original on June 28, 2012. Retrieved November 28, 2009. ^ Booth, William (December 10, 2012). "The Americas". The Washington Post. Archived from the original on November 23, 2012. Retrieved August 25, 2017. ^ Malone, Andrew. Thousands of Mexican soldiers pour into the country's most violent city in crackdown on drug gangs Archived January 21, 2011, at the Wayback Machine, Daily Mail, March 4, 2009. Retrieved March 5, 2009. ^ "Mayor of violence-torn Juarez: 'We're at turning point'". cnn.com/world. Cable News Network. August 31, 2009. Archived from the original on December 15, 2009. Retrieved November 28, 2009. ^ "The 50 Most Violent Cities In The World". Business Insider UK. November 10, 2014. Archived from the original on January 4, 2015. Retrieved January 10, 2015. ^ NAT/AKM (August 27, 2009). "Mexican city world's murder capital". Press TV. Archived from the original on October 5, 2012. Retrieved November 28, 2009. ^ "Juarez shedding violent image, statistics show". CNN. 2014. Archived from the original on January 10, 2014. Retrieved January 9, 2014. ^ Booth, William (August 20, 2012). "In Mexico's Murder City the war appears over". The Washington Post. Archived from the original on August 22, 2012. Retrieved August 23, 2012. ^ "Termina 2015 con 300 homicidios; disminuye violencia en 23% del 2014". Juarez Noticias. Archived from the original on March 4, 2016. Retrieved January 14, 2015. ^ Vulliamy, Ed (19 July 2015). Has ‘El Chapo’ turned the world's former most dangerous place into a calm city? Archived July 21, 2016, at the Wayback Machine. The Observer. ^ a b c Times, Los Angeles. "In Mexico, Ciudad Juarez reemerging from grip of violence". latimes.com. Archived from the original on November 14, 2016. Retrieved October 7, 2016. ^ Nick Valencia. "After years of violence, 'life is back' in Juarez". Cnn.com. Archived from the original on September 15, 2016. Retrieved October 8, 2016. ^ a b c d e CNN, Nick Valencia. "After years of violence, 'life is back' in Juarez". CNN. Archived from the original on September 15, 2016. Retrieved October 8, 2016. ^ a b c Fern, Miguel; CEO, ez; Transtelco (February 17, 2016). "A New Era in Ciudad Juarez | Huffington Post". The Huffington Post. Archived from the original on November 14, 2016. Retrieved October 8, 2016. ^ a b "Once the World's Most Dangerous City, Juárez Returns to Life". May 13, 2016. Archived from the original on October 3, 2016. Retrieved October 8, 2016. ^ "Despite Violence, Juárez Gets Ready for Pope, Showcases Progress". NBC News. Archived from the original on February 24, 2017. Retrieved October 7, 2016. ^ "The Violence Subsides, And Revelers Return To Juarez". NPR.org. Archived from the original on November 15, 2016. Retrieved October 7, 2016. ^ Nájar, Alberto (October 7, 2015). "¿Por qué la película "Sicario" enoja tanto a Ciudad Juárez?" [Why does the movie "Sicario" anger Ciudad Juárez so much?] (in Spanish). BBC. BBC Mundo. Archived from the original on November 14, 2015. Retrieved May 23, 2016. ^ Burnett, Victoria (October 11, 2015). "Portrayal of Juárez in 'Sicario' Vexes Residents Trying to Move Past Dark Times". The New York Times. ISSN 0362-4331. Archived from the original on June 13, 2018. Retrieved October 7, 2016. ^ Inc., Baseball Almanac,. "Juan Acevedo Baseball Stats by Baseball Almanac". Archived from the original on March 28, 2016. Retrieved August 26, 2016. ^ Jornada, La. "Murió ayer Miguel Aceves Mejía, máximo exponente del falsete - La Jornada". Archived from the original on March 4, 2016. Retrieved August 26, 2016. ^ Guerrasio, Jason. "One of the most thrilling scenes from 'Sicario' almost didn't get made". Business Insider. Archived from the original on August 27, 2017. Retrieved November 20, 2015. ^ 2 Cities and 4 Bridges Where Commerce Flows Archived June 5, 2015, at the Wayback Machine, The New York Times, March 28, 2007. ^ fDi Intelligence – Your source for foreign direct investment information – fDiIntelligence.com. Fdimagazine.com. Retrieved on April 30, 2011. ^ The World of Manufacturing Archived July 13, 2011, at the Wayback Machine. Industry Today. Retrieved on April 30, 2011. ^ "Factory Workers In Juárez Unionize For Higher Pay, Better Working Conditions". Fronteras Desk. Archived from the original on December 30, 2016. Retrieved December 30, 2016. ^ Mexico's Maquila Online Directory 2008, Fifth edition, p. 7, Servicio Internacional de Información. ^ Blackman, A.; Bannister, G. "Pollution Control in the Informal Sector: The Ciudad Juarez Brickmakers' Project". Natural Resources Journal. 37 (4). ^ "El periódico Norte de Ciudad Juárez cierra por inseguridad" [The Norte newspaper of Ciudad Juárez closes due to the lack of security]. El Universal (in Spanish). April 2, 2017. Archived from the original on December 5, 2017. Retrieved December 4, 2017. ^ "Mexican Newspaper Shuts Down, Saying It Is Too Dangerous to Continue". The New York Times. Archived from the original on December 4, 2017. Retrieved April 4, 2017. Caballero, Raymond (2015). Lynching Pascual Orozco, Mexican Revolutionary Hero and Paradox. Create Space. ISBN 978-1514382509. Hampton, Benjamin B (April 1, 1910). "The Vast Riches of Alaska". Hampton's Magazine. 24 (1). Harris, Charles H. III; Sadler, Louis R. (2009). The Secret War in El Paso: Mexican Revolutionary Intrigue, 1906-1920. Albuquerque, New Mexico: University of New Mexico Press. ISBN 978-0-8263-4652-0. Harris, Charles H. III; Sadler, Louis R. (2004). The Texas Rangers And The Mexican Revolution: The Bloodiest Decade. 1910–1920. Albuquerque, New Mexico: University of New Mexico Press. ISBN 0-8263-3483-0.
van Wyk, Peter (2003). Burnham: King of Scouts. Victoria, B.C., Canada: Trafford Publishing. ISBN 978-1-4120-0901-0. "Mr. Taft's Peril; Reported Plot to Kill Two Presidents". Daily Mail. London. October 16, 1909. ISSN 0307-7578. Wikimedia Commons has media related to Ciudad Juárez. This page was last edited on 8 April 2019, at 15:13 (UTC).